The Chinese government will invest $250 billion in Latin American and Caribbean countries over the next 10 years in an attempt to strengthen its presence in a region dominated by the US. 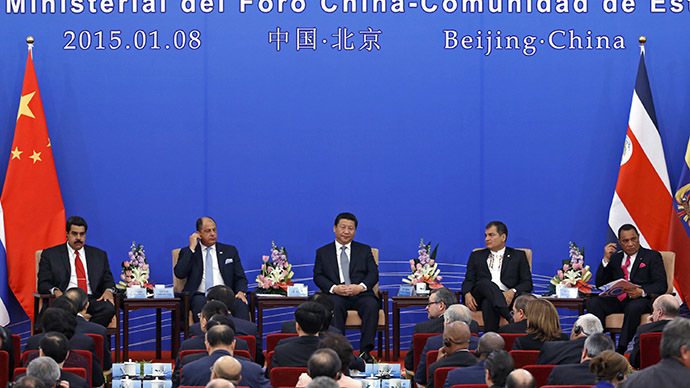 The volumes of bilateral trade between China and the region’s countries could reach $500 billion, said Chinese President Xi Jinping on Thursday, at the first ministerial forum of China and the Community of Latin American and Caribbean States (CELAC). “I believe that this meeting will achieve fruitful results, give the world a positive signal about deepening cooperation between China and Latin America and have an important and far-reaching impact on promoting South-South cooperation and prosperity for the world," he said. The countries are expected to adopt a five-year plan for comprehensive cooperation during the two-day summit held in Beijing. The plans to hold a China-CELAC forum were announced during Xi’s visit to the region in 2014, at which time the countries agreed on a cooperation framework, funds and projects in the fields of energy, infrastructure development, innovation and agriculture. China is interested in the region’s natural resources and wants to buy crude oil in Venezuela, copper in Chile and Peru, soybeans in Argentina and Brazil. The Latin American countries in return get billions of dollars in Chinese investments and long-term credit lines. Xi Jinping and Venezuelan President Nicolas Maduro on Wednesday agreed on the development of joint projects totaling more than $20 billion, while Ecuador received a $7.53 billion loan from China. CELAC is a block of 33 countries established in December 2011, in Caracas, Venezuela. It includes all South American countries, some Caribbean states and Mexico.